As I mentioned in my last post, at Crush wine bistro in Anchorage we had the lucky chance to try two rieslings by one of my favorite wineries in the middle Mosel region: Dr. Hermann. I wrote about the winery extensively here, so please check that out if you are not familiar with them. The 2011 Dr. Hermann H Riesling is their entry level riesling made with grapes from the region. I have been a huge fan of that entry level wine, I thought the 2010 was stellar. When we tried this vintage in June 2011, it was not as vibrant as the 2010 I remembered but still a good $7 bottle (at the winery). At Crush, the wine presented itself a bit more settled. The nose had floral notes and some aromas that I can only describe as doughy (as in cake batter); actually quite pleasant. On the palate, the light-bodied wine showed honey and candied apricots and some pear with a decent enough acidity. In the finish, I got almonds. I still thought the wine tasted a bit too sweet, but it was enjoyable. I miss the 2010, but I can live with this vintage, too. 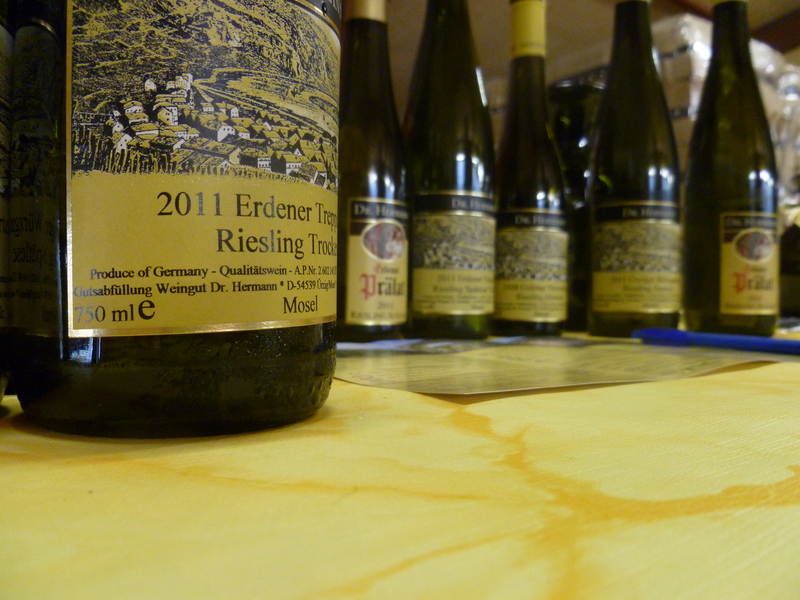 The 2009 Dr. Hermann Erdener Treppchen Riesling Kabinett presented itself as having aged quite nicely. In the past, Erdener Treppchen has been my preferred vineyard for this winery and this wine did not let me down (see a photo of the vineyard here). In the glass, we had a golden yellow, slightly amber wine. The nose showed some signs of that particular aroma that aged rieslings have (I don’t know how to describe it, a bit musty maybe), with detectable citrus aromas. On the palate, this lean wine had already contracted a bit and showed a beautifully round aroma of citrus, apricot and toffee with a medium finish that let on hints of vanilla. At first I was surprised by these signs of ageing because I had not expected them, but when I realized it was a kabinett and not a spätlese (as I had originally thought) I relaxed. A kabinett can show these signs after 3 years in the bottle. As it opened up further, it showed pineapple and red apples aromas, too. It really was quite beautiful and is right for drinking now. Hi…I’ve long followed your blog, as I’m a huge fan of Riesling. 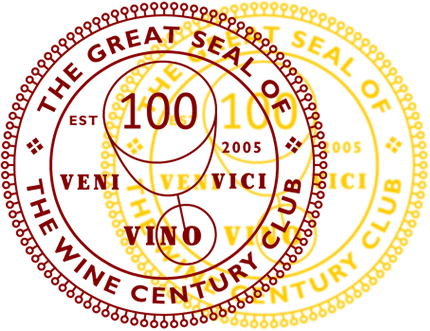 I was quite surprised as I googled a review of the 2009 Erdener Trepchen Kabinett to come across your blog (again) and realize you have enjoyed some wine at Crush! I recently moved back to Anchorage and started my new job at Crush, and I took home a bottle of this delicious Kabinett just today…only to stumble back upon your blog and realize what a small world this is! If you ever come back to Anchorage, please stop by and I’ll buy us a bottle to share at Crush. Great descriptions–I can taste these, just by reading. Nice post. I think Rielsings get a bad rap in the states as the “turkey” wine or “too sweet”. We find the variations to be very versatile. There is so much more to them than just the overly sweet. It’s reputation has been tarnished in the past, but what I get in my glasses is usually really good and balanced. Glad you have a good experience with them, too. Dr Hermann and Markus Molitor are my two favorite Mosel wineries. Great tasting notes – makes me want to put a Riesling in the fridge for tonight! Thanks, Frank! I’ve been mulling that option, too. I still have not had many Molitors but am eager to try them. I can very much recommend the wines from Markus Molitor. They have quite unpronounceable names (like most Rieslings) but they taste really good.